Estimated Delivery to ready after Delivery to as soon as – La livraison estimée au sera prête après La livraison au s'effectuera aussi tôt que : Article offert après – Delivery to not available. La livraison au n'est pas offerte. Estimated Pickup ready after Pickup as soon as – La cueillette estimée sera prête après La cueillette sera offerte aussi tôt que : Article offert après Pickup as soon as – Pickup not available La cueillette n'est pas offerte. Delivery to ready after – La livraison au sera prête après : Article offert après Delivery to not available. La livraison au n'est pas offerte. Pickup ready after – La cueillette sera prête après : Article offert après Pickup not available La cueillette n'est pas offerte. Delivery costs and a selection of delivery/pick-up dates are available in checkout. Delivery and placement in your home. (Premium Delivery Service or Basic Delivery Service). An associate will contact you when your order is available for delivery. Learn More about our in-town (Premium) and our out-of-town (Basic) delivery services available in your area. Free shipping to almost any store of your choice (selected in checkout). An associate will contact you when your order is available for pickup. We offer professionally licensed installation and assembly services at competitive price in many communities in Canada. Call 1-888-933-8786 to check if these services are available in you area. We would be happy to offer a no-charge consultation. This product is being ordered especially for you and therefore is not eligible for refund or reselection once the product has been ordered. Receiving dates are estimates only. As Special Order items must be accepted within 7 days of arrival, we will contact you as soon as possible once received. Bring a mid-century modern look to your entryway with this Arlo bench. Whether you're lacing up your boots or getting the dog ready for a walk, the foam seat provides a plush place to rest. The espresso wood base, angled legs and button-tufted fabric make this piece perfectly retro. Take a seat and enjoy the stylish look of this bench. The button-tufted, light grey fabric seat cover is luxurious and elegant. An espresso-coloured wood finish and angled legs complete the mid-century modern look. Enjoy a comfortable spot to sit thanks to the high-density foam cushion. Rubberwood is one of the most durable and eco-friendly woods in the furniture market today. Once the tree's latex sap is collected for other industries, rubberwood is recycled into home furnishings. The dense grain makes it stable and strong, and the naturally light undertone accurately holds the intended stain colour. The frame's rich, espresso colour complements the mid-century modern design of the bench. Seating with a foam base retains its foundation and structure while giving you a comfortable place to ease your tired body. Polyester fabrics are extremely strong, durable and easy to maintain. Resistant to stretching and shrinking, this fabric will retain its shape and colour after cleaning. Give your wood furniture a new lease on life with this touch-up marker three pack from UV3. Featuring light and dark brown shades, as well as grey, each marker will easily cover up nicks and scratches in your beautiful wood products. Simply colour the offending marks to refresh old furniture or hide furniture scrapes on your wood floors. Long-lasting and durable, these touch-up markers will refresh your wood merchandise discretely. Defend your floors and other furniture or finishes from scratch marks, thanks to these UV3 furniture felt pads. Polyester is felted into a thick cushion to create a protective layer against potential damage from possible scuffs and scrapes. With an adhesive backing, these pads will stick where you put them to ensure your home is shielded from accidents. Give yourself peace of mind with these furniture felt pads. Do you need help installing or assembling your purchase? We can do that! Take the guesswork out of installing your new appliance or assembling your new furniture and let us do it for you. Backed by a one-year warranty on workmanship, we have you covered. You're never under any pressure or obligation to buy, and you won’t believe how quick and easy setting up your new purchase can be! We’re proud to offer Canada’s largest network of certified, licensed installation and assembly professionals. Add this no-charge consultation request to your cart and a representative from our helpful Service Department will reach out to you within 48 hours of your order confirmation to discuss services and rates. TheBrick.com is a division of The Brick Warehouse LP 2004 - 2019 . The Brick Warehouse LP. All Rights Reserved. 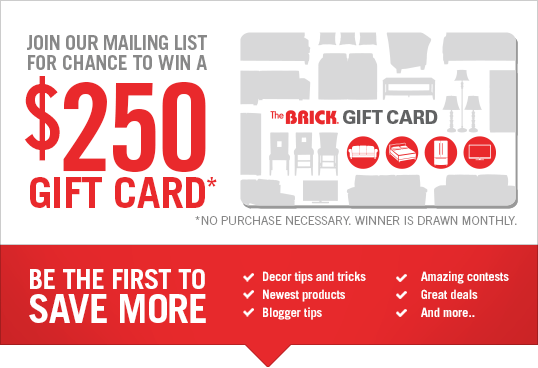 Sign up to receive emails from The Brick.